Action from Pontefract's opening meeting of the season when Snoano (right), ridden by David Allan, won the feature race on the card. Picture: Alan Wright. 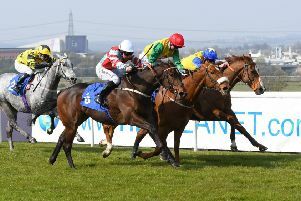 HORSES laden with stamina are no bad thing at the best of times at Pontefract, but never more so than at the track’s second meeting of the season on Monday. The Pontefract Marathon Handicap – over a testing two miles, five and a half furlongs – is the longest flat handicap race run in the country and forms the second leg of the 2017 Stayers Championship in which Uncle Bernie holds an early lead, having enjoyed his first visit to the track at the opening meeting of the year last week. At the other end of the spectrum, the sprinters compete for the richest race on the card, the £20,000 Riu Palace Meloneras Handicap. Perfect Pasture took the prize last year for the in-form Mick Easterby yard before going on to victory in one of the big Irish sprints at the Curragh in July. RIU Hotels and Resorts, who sponsor this race, are once again generously donating an all inclusive weeks holiday for two people to the winner of the best dressed lady competition at the Pontefract Ladies Day on Wednesday, August 9. This year, the lucky winners will be heading to Sri Lanka. Two year olds step forward for the first time at Pontefract this season in the Bananarama at 80s Night Novice Stakes. Trainer Richard Fahey has won the last two renewals of the race and punters will need to keep a close eye on his representative this season. Springwood, a half brother to the yard’s talented Brian The Snail, won the event in 2016. The six furlong maiden race on the card has thrown up some decent winners in the past. There was a dead heat last year as Kevin Ryan’s Brilliant Vanguard and Brian Ellison’s Zebedaios could not be separated at the post. The latter has since been sold to race in Hong Kong where he is competing in some of the top handicaps at Sha Tin and Happy Valley. The race will hopefully reveal some promising horses to follow in 2017. The Lynsey Bacon Memorial Handicap remembers the partner of a regular racegoer and owner at Pontefract. Lynsey sadly passed away last year and this is the first race to be run in her memory. The race itself attracted a huge number of runners last year and had to be split in to two divisions.Both races were won by the all conquering Richard Fahey yard who was registering a treble on the card! Those living in York can pick up a free ticket for this meeting if they register for the racecourse postcode lottery scheme before the day – all postcodes throughout Yorkshire will be able to get tickets to specific meetings throughout the year. Full details of the card next Monday and the rest of the 2017 season at Pontefract can be found by visiting the racecourse’s website at www.pontefract-races.co.uk.